Working with adolescents is a challenge in any helping role. Teachers, counselors, volunteers and youth leaders all experience some of the same obstacles when working with this age group. “How do you communicate understanding to resistant teenagers? Do they respect me? Why are they always in a bad mood? Do they ever make eye contact? What are appropriate expectations for behavior?” In What Works with Teens, licensed social workers Britt Rathbone and Julie Baron address many concerns that face people working with adolescents by providing information on development as well as tangible ways to help build better relationships with young people. Part 1 of the book, “Welcome to the World of Adolescence,” gives a succinct summary of adolescent development. Rathbone and Baron set the foundation of adolescent socio-emotional behavior by giving a brief overview of teens’ brain structure. Rathbone and Baron discuss neuroscience in a way that makes the information attainable and understandable to people of any profession, including those with limited background in this type of science. They then discuss the priorities of adolescents, their emotional needs, and stereotypes that adults may have about young people that cause barriers in their work and in connecting with adolescent clients. While detailing components of adolescence that adults may have forgotten, the writers also highlight many similarities that adults and teens have in the ways they think and the things they value. The authors state that everyone values respect and authenticity; the expression of those qualities may just look different in adults and teens. In part 2 of the book, “Putting Skills to Work,” the authors discuss important qualities needed when building relationships with young people, while giving tangible ways to improve and to measure success in work with youth. The book discusses respect, authenticity, kindness, predictability, acceptance and change. In each chapter there are anecdotes of times when adolescents experienced as well as failed to experience these qualities in their relationship with adults. These stories help emphasize the importance of relationship in creating change within young people as well as provide a context for readers when thinking about their own work with youth. Although not specifically written for counselors, What Works with Teens is a very useful resource for professional counselors in school, clinical mental health or college settings. The skills discussed in part 2 complement the strength-based approach that counselors take when working with others. What Works with Teens highlights the importance of building relationships with teens and empowering them to make their own change, much like counselors do in their work with others in any setting. This book aims not to teach adults on how to tell young people what to do, or what they should do, but rather is an aid to adults in building better alliances with adolescents. The qualities discussed in What Works with Teens are valuable in not only working with teens, but in any therapeutic relationship. The authors emphasize meeting all adolescents where they are, an approach that counselors often take with any client. What Works with Teens is a comprehensive resource for any professional working with young people. Beginning with adolescent development, the authors outline how and why adolescents often behave and feel the way they do. The authors then proceed to discuss ways to help build positive relationships with youth, and how to incorporate teens into discussion of the relationship and ways to improve. An authentic and trusting relationship between youth and adults is essential to healthy growth and development. What Works with Teens gives adults attainable goals in building relationship with youth. Using these values to build a therapeutic alliance, adults will be better equipped to empower teens to take ownership of their own growth and development. Rathbone, B. H., & Baron, J. B. (2015). 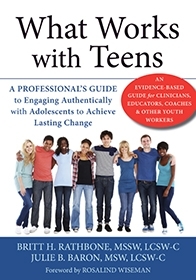 What works with teens: A professional’s guide to engaging authentically with adolescents to achieve lasting change. Oakland, CA: New Harbinger. Reviewed by: Hannah Kirby, NCC, Creative Counseling and Learning Solutions, Rowan County, NC.